Our struggles with starting a family have forced both my sister and I to look in detail at our lifestyles and where we can make changes to better our chances. As I've gone through my personal infertility journey, I’ve learned a lot about the hidden toxicity of a lot of the items in our homes. I have since made it my mission, as an interior stylist, to educate myself on what furniture items are the most problematic and what healthy alternatives exist. One of the biggest toxic culprits in our homes? The mattress. And we spend nearly a third of our lives sleeping on it! Learning this really opened my eyes and convinced me to do a bedroom detox. Did you know that most mattresses are made of polyurethane foam, a petroleum-based material that emits volatile organic compounds (VOCs) that can cause respiratory problems and skin irritation? Formaldehyde, used to make the adhesives that hold mattresses together, has been linked to asthma, allergies, and lung, nose, and throat cancers. And then there are cotton pesticides and flame-retardant chemicals that off-gas and pollute the air of your bedroom and are linked to cancer, hormone disruptions and adverse effects on the immune system. Crazy, right? Luckily, there are more and more companies out there creating healthier mattresses using non-toxic materials, so we can all sleep better at night. I’ve learned that latex-based mattresses are a great healthy option. Latex is a renewable material made from rubber tree sap and unlike polyurethane, it is less likely to emit high levels of VOCs. Latex is also highly resistant to mold and dust mites, and is more durable than petroleum-based foam. Natural latex mattresses are increasingly easy to find at reasonable prices. The one I narrowed in on was the Zenhaven mattress from Saatva. I love that it is handcrafted in America of 100% natural American Talalay latex and is layered with breathable 100% organic New Zealand wool - a natural fire retardant with no need for additional chemicals. It is then wrapped with a GMO-free organic cotton. Zenhaven is certified by an independent certification body and has the Oeko-Tex Standard 100 certification - the internationally accepted standard for certifying textiles and home furnishings. There is no higher measure of textile purity and safety. ZenHaven also offers a 120 home trial period, Yay! I also love that the Saatva Company is part of the growing number of companies committed to healthy, pro-planet furnishings. SFC members take immediate steps to minimize carbon emissions, waste stream pollutants, unrecyclable content, and primary materials from unsustainable sources in any product platform under its control. I was officially on board to replace our old mattress, but convincing my husband to shell out a couple of grand for a new mattress when it wasn't previously on our priority list was a different story. So I emailed Saatva to learn a bit more and was open with them about our infertility journey, and my reasons for wanting to upgrade to the Zenhaven mattress. To my surprise, the Vice President of eCommerce emailed back right away and explained that his wife also struggled with infertility, one of the main reasons why he purchased a Zenhaven for his own home and why he now works at the company! He ended up sending us a free mattress to try, and in return, I promised to give it an honest, personal review for the LoP blog. My review: Firstly, I was very impressed by their quick customer service and genuine concern for my husband and my story. This really seems like a company that cares. I was excited to try the mattress and after a few nights sleeping on it, even more excited that my husband loved it. He can be pretty particular about these things so getting his approval is a big win. The mattress itself is comfortable and feels luxurious to lay on. There is no weird smell and I have peace of mind knowing that we aren't inhaling toxic chemicals while we sleep. However, we do love "sinking" into a mattress and with latex, you really don't get that feeling. Since it isn't quite as “soft" as we like, we will be adding an organic wool or feather topper at some point to give us that added sense of sinking in but all-in-all I am a huge fan of this product and would definitely recommend it to anyone looking for a non-toxic, latex mattress. I will slowly be upgrading the rest of the mattresses in our home because we truly sleep better since we made the switch. For the completion of our bedroom detox, we also replaced the items we put on top of our mattress with healthy alternatives. We upgraded our standard duvet and replaced it with Buffy. Buffy duvets are 100% hypoallergenic and are made from eucalyptus fiber (also knowns as Lyocell) and recycled polyester microfiber. Their fabrics are OEKO TEX Standard 100 certified. They do not use any fire retardants or other chemicals in the Buffy duvet. It is very soft and fluffy and with a 30-day free trial, was impossible not to try. We chose Boll & Branch organic cotton bedding for our sheets and duvet cover. Conventionally grown cotton uses more insecticides and pesticides than any other crop in the world, using about 16% of the world’s pesticides. Boll & Branch use eco-friendly, Global Organic Textile Standard (GOTS)-certified dyes—never chlorine. Another great organic option we love is Coyuchi. For our extra layer of softness, I am looking at various mattress toppers from Naturepedic (they also offer organic mattresses). I am not sure yet which one we will purchase but this brand is highly reputable and Certified Organic to the Global Organic Textile Standard (GOTS). Have you made the switch to a latex mattress? Do you have any favorite toxin-free products in your bedroom? We love hearing what are readers are loving. This is a sponsored conversation written by me on behalf of Saatva. The opinions and text are all mine. 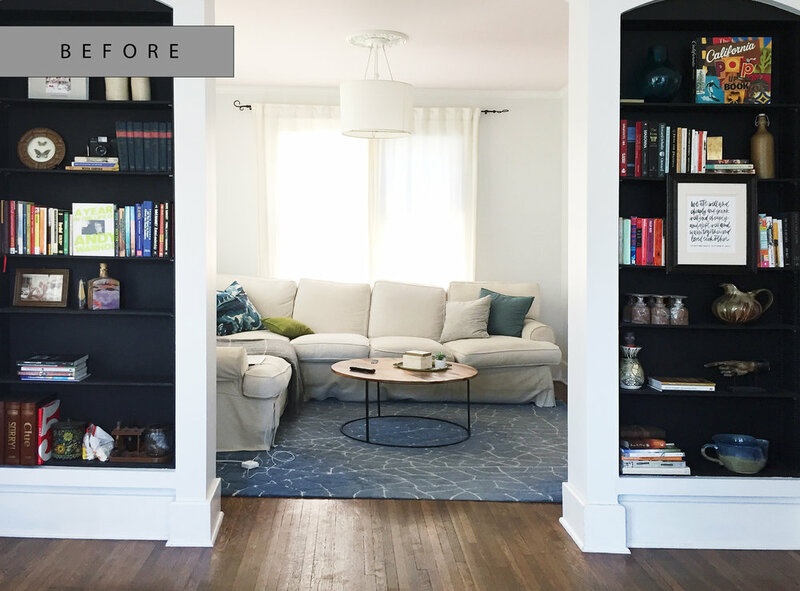 I am starting 2018 off with a living room refresh! The winter weather has coaxed my husband and I into spending more time by the fireplace in our front room, which means more time staring at the adjacent living room. While the living room is functional as-is, I’ve learned a lot about my personal style through designing the last few years, and I’m feeling a bit restless and eager to be bolder in my own space. This is the perfect room to incorporate changes that reflect this evolution. Here is a current photo of the room. The major mistake I made in this room was never having a design plan for it. The only update I knew I wanted to make, initially, was painting the walls white to match the front sitting room so it feels more like one, big room. The room is small (11 feet x 11.5 feet) so when we first moved in we did invest in a perfect-sized sectional couch from Robin Bruce (found here) to help maximize seating. The splurge is one I’m glad we made. Four years later the couch still looks great and is just as comfortable. The higher back and down-wrapped cushions support long sitting sessions (movie night anyone?) and the slipcover means I can throw dirty cushions into the washing machine. The one thing I wish the sofa did have was a longer, more minimal bench seat cushion, to give it a more streamlined and modern look. Unfortunately, despite endless searching, I could not find an option that fit our specific dimensions and budget. And while I love a modern sofa, Andrew is a huge advocate for comfort. The couch we chose in the end has been perfectly cozy for the room, which we spend a ton of time in. DESIGN TIP: I highly recommend investing in a high-end (the best you can afford), neutral sofa that will stand the test of time, hold up to use, and outlast trends. It is easier to add style to a room with affordable accessories that you can change out as your tastes evolve, than having to replace a large item, like your couch. Lack of contrast: A cream sofa against white walls with natural linen curtains and a white chandelier shade = boring. Adding contrast will add much-needed sophistication. Lack of texture: There is so much fabric in this room! A slipcovered sofa with a skirt, long curtains behind the sofa, a fabric shade on the light fixture and decorative pillows - it’s all just too much. Trendy decor: There is nothing wrong with rustic, industrial style (I love it in the right setting). This coffee table was my attempt at incorporating the trend into our space. Unfortunately, there isn't anything else even remotely rustic industrial anywhere in our home and our home is a 1939 bungalow. I’ll admit the purchase was more an afterthought than an intentional addition to the space. I'd love to find a unique coffee table that will also add personality. Limited changes: My long-term vision for this room is to make it an office when we completely renovate our home, so I won’t be making any structural changes. Incorporate modern touches: One of my personal design preferences is adding vintage accents to new, modern homes to help create a feeling of history, and adding modern accents to update older homes. Because our 1930’s bungalow already has a ton of character, I want to replace our bland light fixtures with something modern and sleek, to add contrast. Add personality: I plan to purchase a better fitting coffee table and side chair that will simultaneously add personality. I am also open to replacing the rug (or getting ours professional cleaned), whichever works best with the new design. Update window treatments: These sheer, linen IKEA curtains are closed most of the time because they are a pain to open (I actually have to stand on the couch to open and close them). It’s a shame because this room gets the best light in the house and we aren’t currently taking advantage of that. I'd love to replace the curtains with something more functional that also shows off the wonderful wood window trim. I mean, why cover that up?! Maybe a fabric or textured roman shade that adds coziness or perhaps even some pattern. Accessorize: Nothing beats real, original art. I’d like to include more of it to elevate the room. Buying art is also a great way to support the creative community which I am a huge advocate of. While I’d prefer to get the budget down to $2500, I want to allow myself some room in case I find some truly unique pieces. Plus, I’ve learned that great design does often cost more money - especially if you are buying something that is custom. At this point, I’d prefer to invest in fewer, high-quality items that are built to last. What do you think of my design plan? Do you have a room you want to refresh this year?